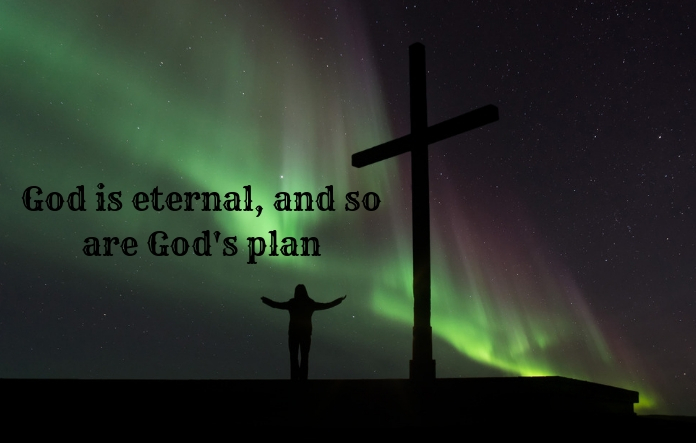 God is eternal, and so are God’s plan. The plan was established in eternity past, long before God created the heavens and the earth. You are in the hands of a living, loving God. Random collection of disconnected short stories? Far from it. Your life is a crafted narrative written by a good God, who is working towards your supreme good. God is not slipshod or haphazard. He planned creation according to a calendar. He determined the details of salvation “before the foundation of the world” (1 Peter 1:20). The death of Jesus was not an afterthought, nor was it Plan B or an emergency operation. Jesus died “when the set time had fully come” (Galatians 4:4 niv), according to God’s “deliberate plan and foreknowledge” (Acts 2:23 niv). God isn’t making up a plan as he goes along. Nor did he wind up the clock and walk away. “The Most High God rules the kingdom of mankind and sets over it whom he will” (Daniel 5:21 esv). He “executes judgment, putting down one and lifting up another” (Psalm 75:7 esv). “The Lord will not turn back until he has executed and accomplished the intentions of his mind” (Jeremiah 30:24 esv). Look at those verbs: God rules, sets, executes, accomplished. These terms confirm the existence of heavenly blueprints and plans. Those plans include you. “In him we were also chosen, . . . according to the plan of him who works out everything in conformity with the purpose of his will” (Ephesians 1:11 niv).